Slightly hilly with mixture of open and tight wooded fairways. Some dense rough. Activity center with snack bar, etc. $10/car ($35 annual). Added $3/player fee ($55 annual pass available at office). From US 23 north of Ann Arbor, take exit 49, N. Territorial, west 8 miles to park, course behind activity center, blue and red tees. 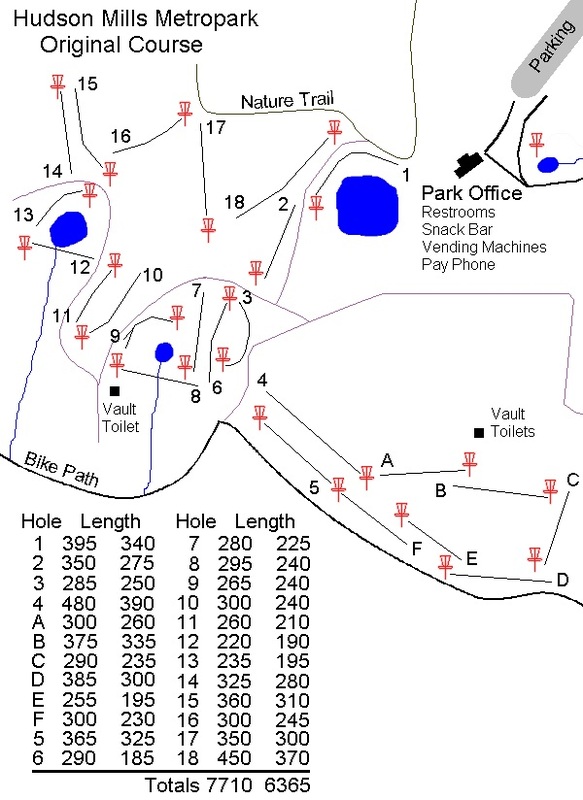 The complex is the best in the state 2 course both amazing courses within 200 ft from each other the fees are a little high with $5 to enter the park $2 to play or $25 yearly to enter the park and $50 to play as yearly fees. I have to say original is easier than monster and unlike independence the course is installed all year long. The course is beautiful nice wife fairways for half the course the wooded ones are still a bit wider than I'm used to but still very nice it my home course so I'm partial but nice and long course and when our group worked to design the Merrill field course this was our inspiration a course everyone could play and everyone would find interesting because that is what Hudson mills is... All around a great course. the best course i've ever been to...some long holes, some short holes...i've seen a rattlesnake out there...if you are in the area, this place is a must! 24 holes of amazingness!